We are occasionally asked about visiting the three cemeteries under the care of the Association. Here are some items you need to know. -We ask that you contact the Association by email at meadburyinggrounds@gmail.com. Please provide us with your full name, phone and/or email address and which site you wish to visit. -If you are looking for historical information send your inquiry to us in advance since it helps expedite the process. We encourage you to use the Search box on this blog site. You may find what you are looking for here. -If you are visiting from out-of-town or from out-of-state let us know when you wish to visit -the sooner the better. -Be respectful. Yes, this makes common sense, we hope. -Do not leave any trash whatsoever. -Stone-rubbing is not permitted. Photography is permitted. -We ask that you not leave memorials such as coins, flowers, photos and so on. -We remind all that the three isolated family plots under our direct care and stewardship are not public cemeteries. Family descendants are certainly permitted to visit the graves of their ancestors. -There are designated rights-of-ways that connect the cemeteries to the roads and streets for purposes on ingress and egress. Please do not stray on to the properties of our neighbors. -There are many Mead ancestors interred in other cemeteries and burying grounds around Greenwich. Rules vary with each. If you have any further questions kindly contact the Association by email at meadburyinggrounds@gmail.com. Thank you. 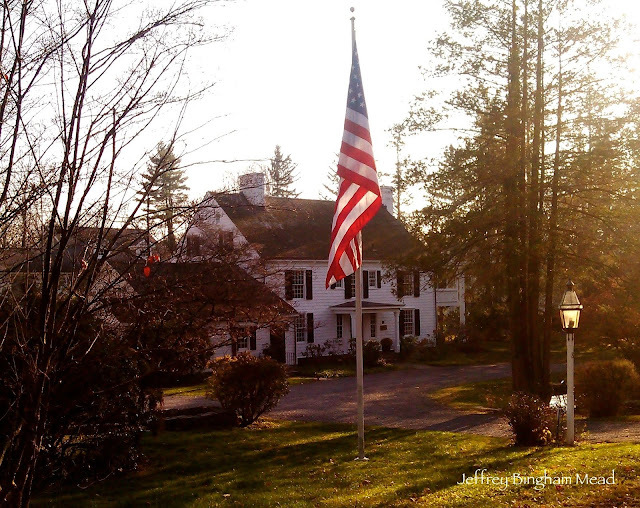 "Dearfields," at 8 Grove Lane. 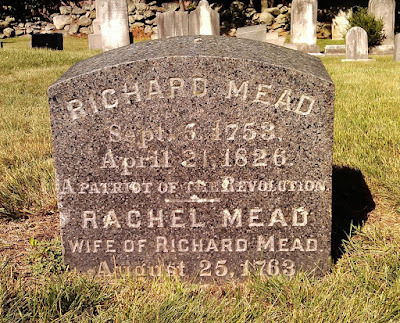 Resting eternally in Greenwich, Connecticut's cemeteries and burying grounds are those who fought and served in the American Revolution. Below is a compiled listing of their names. 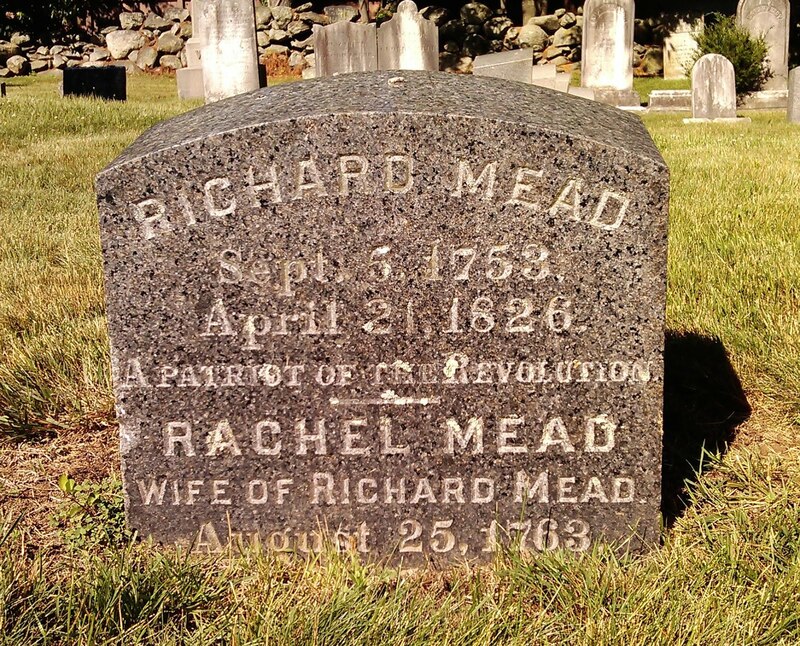 You'll notice that some names are not Mead descendants, at least by surname. We remind our readers that as our ancestors were prolific we surmise that many of those listed here are related to the Mead's of Greenwich through descent, marriage and so forth. *We expect this list to be updated. Happy July 4, American Independence Day. Thomas Hitchcock d. December 29, 1813 aged 56 years & 4 months. Samuel Mills d. January 22, 1841 aged 89 years. John Addington d. Dec. 14, 1830 aged 87 years, 3 months, 6 days. aged 83 years, 2 months and 24 days. Nehemiah Brown, Jr., d. August 8, 1840 aged 85 years.